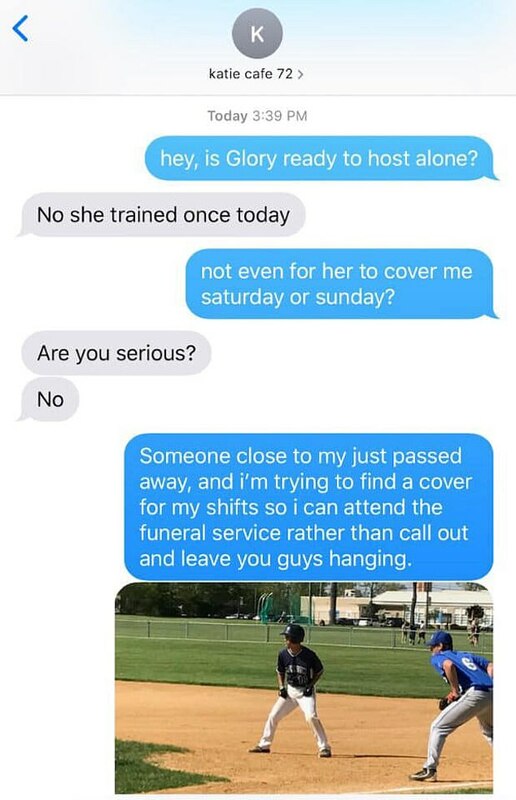 A restaurant hostess in New Jersey shared a shocking text exchange with her boss who told her not to return to work if she attended a friend’s funeral instead of making it in for her shift. 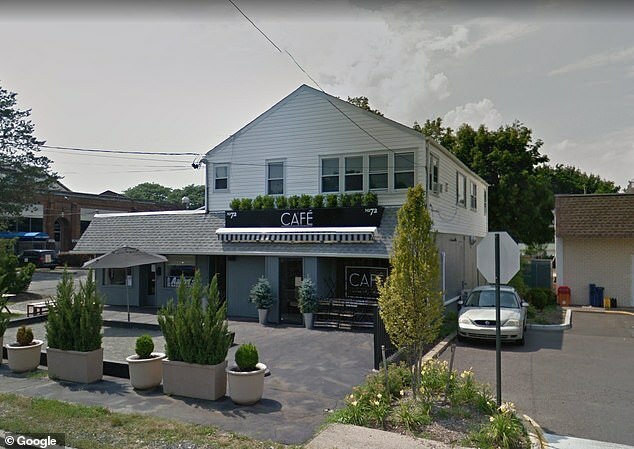 The unidentified hostess at Café Seventy-Two in Ewing Township texted her manager in hopes to arrange for her shift to be covered so she may attend the funeral service scheduled for this weekend. Outraged, her boss replied to the request: ‘Oh wow thanks. Just don’t come back to work. 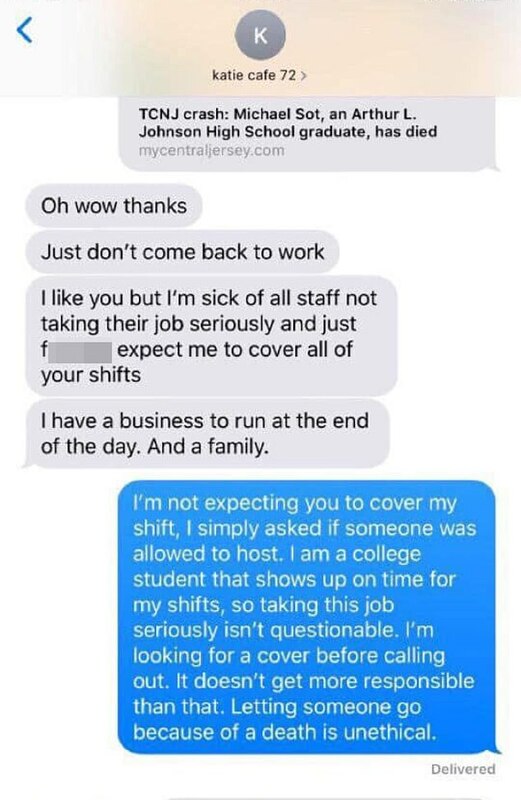 The employee wrote back: I’m not expecting you to cover my shift, I simply asked if someone was allowed to host. I am a college student that shows up on time for my shifts, so taking this job seriously isn’t questionable. The boss added: ‘I’m not playing this game. If you can’t work and there is no one to cover the shift in order for the restaurant to operate I have to let you go. Sorry. I don’t feel bad for you so don’t pull the college student unethical card. It’s not the first time. Café Seventy-Two has since deleted their social media pages after they received an overwhelming amount of hate mail and poor business reviews as a result. The manager’s husband, who goes by Ben, released an apology statement to their website on his wife’s behalf. The apology said in part: ‘The employee was not fired. Her last shifts were this weekend before leaving for holiday break to be with her family and friends until January 28th. This private conversation was not related in any way to the mourning of Michael. 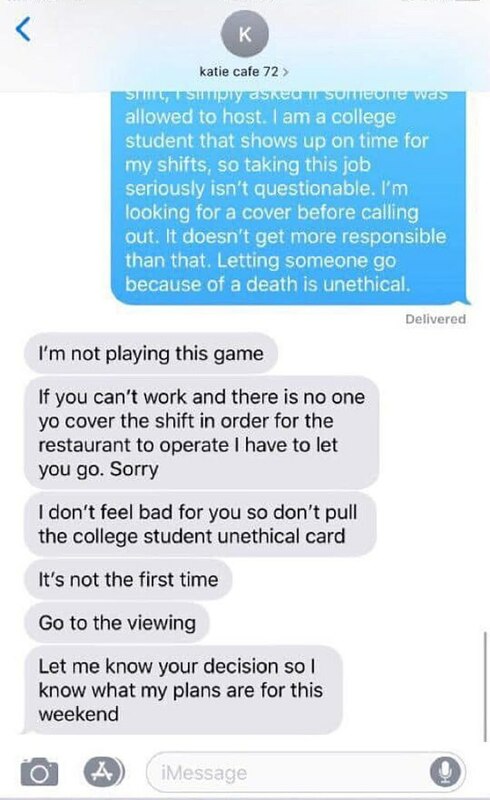 ‘Although this interaction was displayed completely out of context by a friend of the employee and drastically misrepresents Katie and our establishment, we recognize that there is NOTHING that excuses it. The couple also contributed a $1,000 donation to the family of the late Michael Sot. 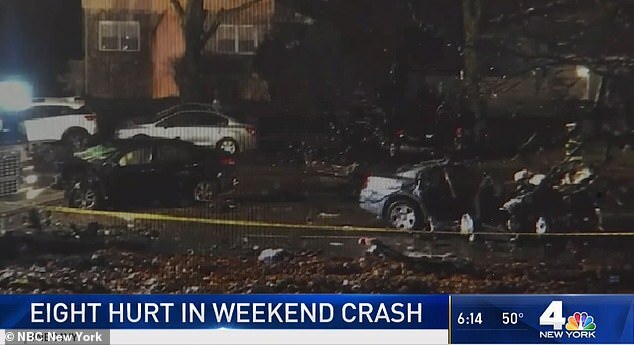 The 20-year-old college student was killed by an impaired driver who smashed into his vehicle near a New Jersey college on Sunday. 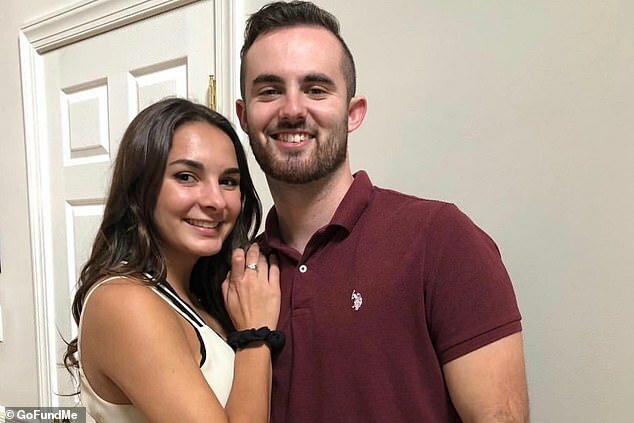 According to the GoFundMe account, Sot was the designated driver for four other students when the crash occurred about a mile from The College of New Jersey. Police said a car driven by David Lamar V, 22, crossed into an oncoming lane and collided with the car Sot was driving. Lamar, who was in the car with one other passenger, was reportedly impaired at the time of the crash. Sot was rushed to a local hospital where he succumbed to his injuries. Details of Sot’s injuries were not revealed. Danielle DeFlores, 21, Matthew DeGenova, 21, Anthony Galante, 19, and Ryan Moore, 21, were all riding in Sot’s vehicle. All of the students suffered injuries in the crash. Some of those injuries include broken bones, a ruptured bladder and a brain injury, according to NBC. 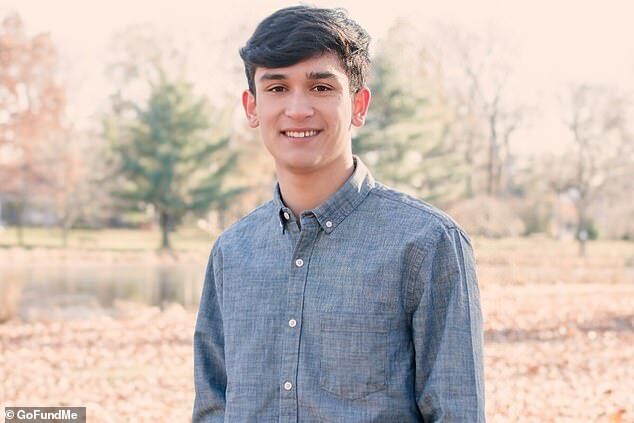 Police said the crash occurred on Pennington Road, where Sot’s father said his son had been driving back and forth to shuttle students to an off-campus party that night. The College of New Jersey’s president, Kathryn A. Foster, told NBC that news of Sot’s death ‘is heartbreaking’. ‘The TCNJ community is keeping his family, friends and loved ones in its thoughts during this tremendously difficult time,’ she added. The Mercer County Prosecutor’s Office said Tuesday that Lamar is expected to be charged with vehicular homicide. Money raised on GoFundMe will be split between those affected by the crash to help pay for medical bills and other fees.